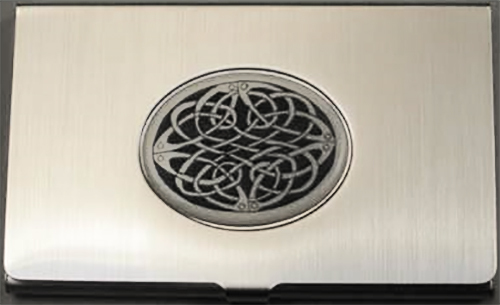 Irish business card holder features a Celtic knot design on the hinged metal lid. Sorry, the Celtic business card holder is now sold out. This business card case is embellished with a faux ivory resin Celtic knot emblem on a lacquered brushed steel holder. The hinged Irish business card holder measures 3 3/4" x 2 1/2" and is gift boxed with a Celtic knot history card, complements of The Irish Gift House. Irish business card holder features the Claddagh emblem on a hinged metal case. Claddagh pocket knife and combination key ring features the Irish icon on a faux ivory resin plate. Celtic pocket knife and combination key ring features a knot-work motif on a faux ivory resin plate.